Each week we gather for worship in our sanctuary* at 440 1st Street NE in Linton at 10:30 AM for worship, following a Fellowship time that is open to all at 10 in our Fellowship Hall. Our sanctuary has a main floor and a balcony that are both open to anyone. You can find the balcony by going upstairs from the landing near the big wooden doors to 1st Street. Should you need wheel chair access or like to avoid stairs we have an elevator that will get you to the sanctuary as well: come in the Fellowship Hall entrance and you will find the elevator beside the staircase. A Nursery is provided each week for babies up to three years old and can be found by going downstairs from the same wooden doors. Hearing Assistance Devices are available for those needing them by asking the folks in the sound booth. Children's activity books are available on the table behind the sound booth for any kids that need an activity before Children's Church or that elect to stay upstairs throughout worship. Our worship service is a blend of many styles. We are informal in a lot of ways: there is an announcement time, a time to greet those around you, the sharing of prayer concerns, our acolytes and ministers no longer wear robes, and a lot of laughter can be heard in service. But in other ways we are fairly formal: we have a liturgical call to worship, say the Lord's Prayer together at the end of prayer, sing a doxology after taking up an offering, and recite our mission statement each week after a benediction. ​Often you will find a blend of music in worship as well; from hymns to southern gospel, from contemporary Christian to hand bells, from brass quartets to praise songs, original songs, solos, ensembles, choirs, and a praise band. There are a lot of talented musicians and no one flavor to the music that we incorporate any given week. We think that quality should be the standard we are aiming for rather than one particular style. Whatever the style, what we offer musically is a real blessing; both to those who share and those who hear it. Quality music has been a hallmark of Saron for generations. Similarly, the attire of our participants reflects a wide range of styles. Some men still wear suits and ties, some ladies still wear dresses, but others wear jeans, button up shirts, polos, and sweaters. We never want what you wear to be a reason you don't join us. And more than likely you'll see a few folks dressed just like you. When you come to Saron, whether you come in the big wooden doors up the stairs from 1st Street or you come into one of the glass doors into our Fellowship Hall, you will climb stairs to make it into our Sanctuary. Once there a greeter will welcome you to church and hand you a bulletin. This will have a welcome, the worship order, some information pertinent to the service, and announcements about upcoming events at Saron. There are several folks who have sat in the same place for a lot of years, but there are no assigned seats at Saron. We want guests to feel welcome wherever they feel comfortable to sit and experience our worship service. Our worship begins with announcements, usually led by one of our Pastors, and then a greeting. We encourage you to "greet those around you and welcome them to church this morning." Our liturgist for the week then asks us to join him or her in the Call to Worship. This is usually a call and response that is projected on the screen. Following this we sing praise songs led by our praise band, then the kids come forward for a children's moment and head to Children's Church after, while we have a time of prayer in the sanctuary. After prayer there is typically a piece of special music we dub "Music to Glorify God" and then every week our liturgist reads the scripture passage for the week and one of our Pastors offers a sermon. After the sermon is usually a time of offering when we collect folks "tithes and offerings," then sing a doxology and pray over the gifts. We close with a hymn, a benediction, saying our mission statement out loud, and then singing a benediction response. That's it! A solid, simple service with elements that are both traditional and contemporary, formal and informal, participatory and passive. We believe we have a warm congregation who would make a great community for anyone in search of one. Communion: Once a month (the first week of every month) and on some special worship occasions we participate in Holy Communion and receive bread and juice to remember that Jesus's body was broken and blood was shed for our forgiveness. Ash Wednesday, Maundy Thursday, and Good Friday: Each of these days within the Lenten journey we offer some form of worship service. Occasionally we join with other churches, but most often we have something here at Saron in the evening for each. Ash Wednesday is highlighted by the imposition of ashes, Maundy Thursday by a remembrance of Jesus's Last Supper with his disciples, and Good Friday an observance of His Crucifixion. Check our Newsletter for details as Easter approaches. Sunrise Service at the German Cemetery: Each year we offer a worship service at the German Cemetery just north of the Linton schools to welcome Easter morning, as we celebrate the stone being rolled away at Jesus's tomb. A devotion, prayer, and music highlights this simple service. Christmas Eve: Saron has put together wonderful Christmas Eve services dating back many many years. For the last fifteen years there have been two Christmas Eve options for worship at Saron. A more traditional service with brass quartet, bells, choir, and hymns has happened in the evening and a less formal service for families begins at 11 and ends with Silent Night as Christmas arrives. Check Newsletters for more details as Christmas gets close. 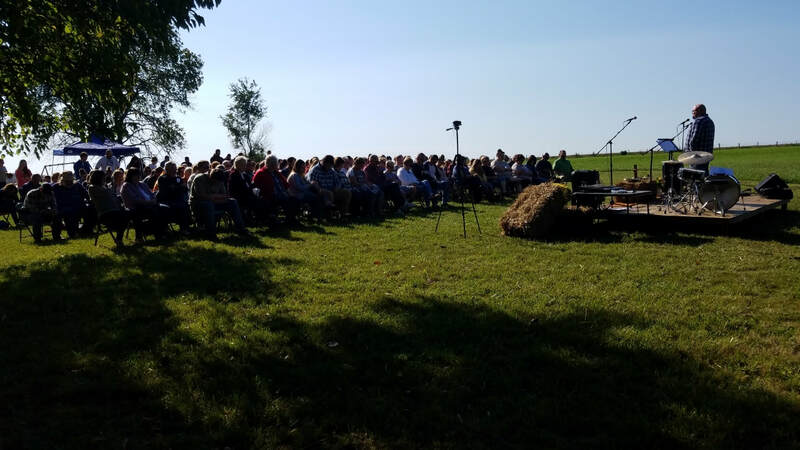 *Outdoor Worship Service: Once a year, the last Sunday in September, Saron's Sunday morning worship moves to the farm of Edgar Greene and his family. Men's Fellowship smokes hams and serves breakfast, we worship outside next to a lovely pond, we set up a tent for kids to play in, we sing gospel songs led by our praise band and friends, and we baptize a few folks to close the service each year. This is an important tradition at Saron and we look forward to this Sunday every year!